Despite their enormous size and dangerous nature, polar bears are considered beautiful by many people. They are symbols of winter, populating holiday cards and wrapping paper. Both children and adults will enjoy learning to draw them with these easy-to-follow steps. 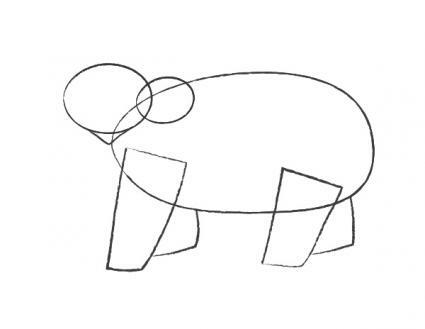 Drawing a polar bear is a simple process of creating basic shapes and then connecting them. 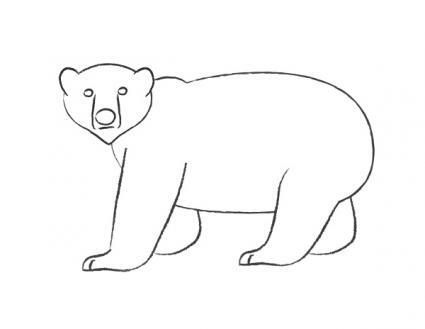 As you work you'll add more detail until your drawing begins to really look like a polar bear. You can use the same basic process to draw other animals like a fish or an eagle. 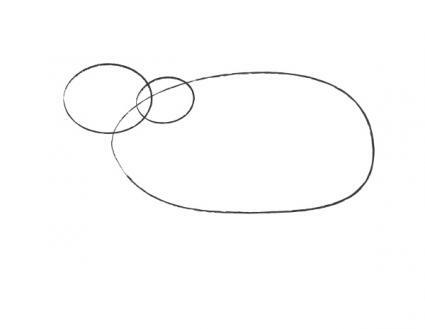 To begin the drawing, lightly sketch a horizontal oval that is a little higher and wider on one end. Add another smaller oval for the head. Add another small oval for the shoulder hump. The oval for the head should slightly overlap the top (thinner end) of the body, and the oval for the shoulder should overlap the head oval and the thinner end of the body oval. Add a rounded triangle to the bottom of the oval for the head. This area is the bear's chin and neck. Add two rectangles slanting forward, slightly tapered toward the bottom, one on each side of the large oval. Sketch in two triangles behind these rectangles, pointing in the opposite direction. 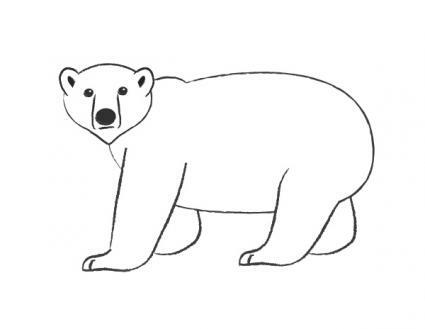 These rectangles and triangles define the polar bear's leg placement. Note that the bear's facial features are small in proportion to his size. Add small ovals on each side at the top of the bear's head. Sketch in an oval for the nose. Draw small ovals for the eyes. Draw two long vertical "J" shapes from the inner eyes to under the nose for the sides of the muzzle. Draw a horizontal line under the nose for the mouth. The bear's feet are big, blocky, and furry. The bear uses his feet like snow shoes so he does not sink into the snow. Soften the lines of the front legs and feet and give them more definition. Add curved lines to mark his "toes." Round the back legs slightly. Darken the inside of the polar bear's ears. Darken his eyes, leaving a bit of white in the dark pupils. Darken the lines you want to keep, and erase unnecessary sketch lines. You can shade the bear slightly to give it more dimension. 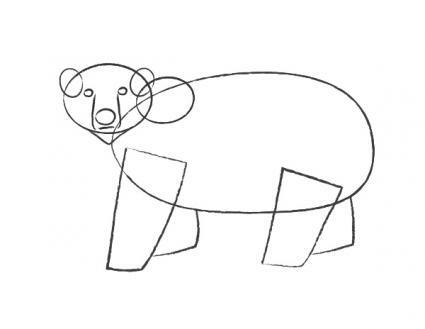 Make your outlines slightly rough and fuzzy so your bear appears to have fur. 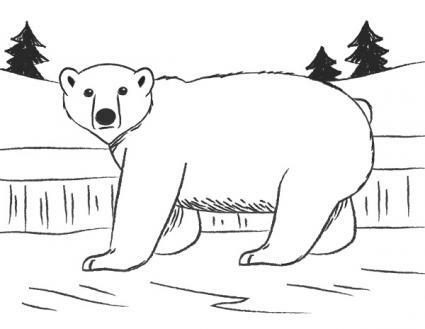 You can add snow drifts, water features, and evergreen trees to your drawing to give your bear a habitat. To make your bear more interesting, you can use colored pencils, water colors, or markers to add more shading or to fill in bright colors in the background. Snow and ice tend to reflect pale blues and grays from the sky. Water can be rendered in blues, blue greens, and greens.